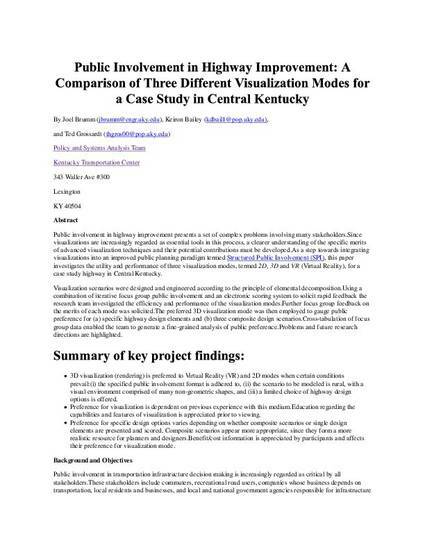 Public involvement in highway improvement presents a set of complex problems involving many stakeholders.Since visualizations are increasingly regarded as essential tools in this process, a clearer understanding of the specific merits of advanced visualization techniques and their potential contributions must be developed.As a step towards integrating visualizations into an improved public planning paradigm termed Structured Public Involvement (SPI), this paper investigates the utility and performance of three visualization modes, termed 2D, 3D and VR (Virtual Reality), for a case study highway in Central Kentucky. Visualization scenarios were designed and engineered according to the principle of elemental decomposition.Using a combination of iterative focus group public involvement and an electronic scoring system to solicit rapid feedback the research team investigated the efficiency and performance of the visualization modes.Further focus group feedback on the merits of each mode was solicited.The preferred 3D visualization mode was then employed to gauge public preference for (a) specific highway design elements and (b) three composite design scenarios.Cross-tabulation of focus group data enabled the team to generate a fine-grained analysis of public preference.Problems and future research directions are highlighted. Published in the 2001 Proceedings of the Environmental Systems Research Institute User Conference, Paper 428.